Microsoft Press has offered a free eBook for download. 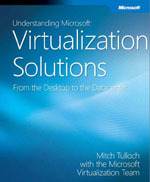 The book, titled “Understanding Microsoft Virtualization Solutions” (ISBN: 9780735693371) is authored by Mitch Tulloch together with the Microsoft Virtualization Teams. “Understanding Microsoft Virtualization Solutions” provides provides a thorough look at the capabilities, features, and operations of Microsoft virtualization technologies from the desktop to the datacenter, and how to plan, implement, and manage virtual infrastructure solutions. “Understanding Microsoft Virtualization Solutions” is a 417-page Microsoft Press book, and is now available as a 14.4 MB PDF free digital download. The book covers all aspects of virtualization technologies, include: Windows Server 2008 Hyper-V, System Center Virtual Machine Manager 2008, Microsoft Application Virtualization 4.5, Microsoft Enterprise Desktop Virtualization, and Microsoft Virtual Desktop Infrastructure.